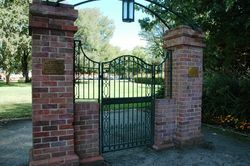 Gates commemorate Samuel Lewins, the local bandmaster of the Bathurst District Band from 1885 to 1935 and were erected during the jubilee year of the band. 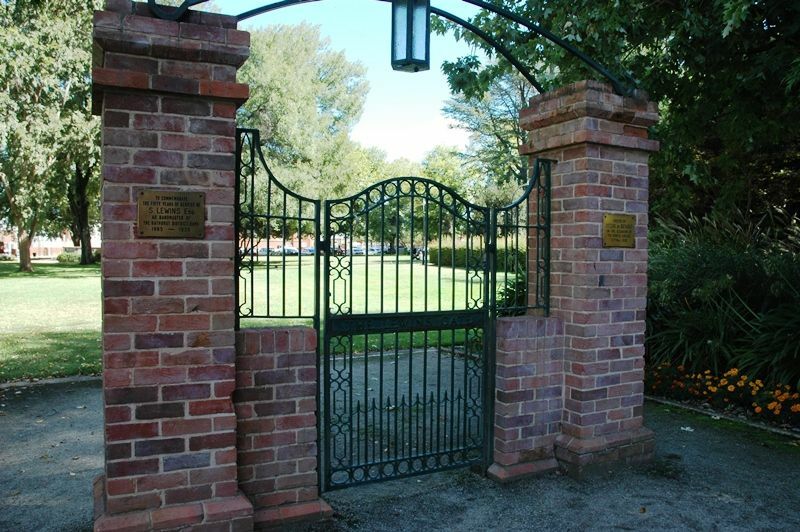 The gates were fully restored and re-sited near the Bathurst Memorial Entertainment Centre in 2003. Samuel Lewins was appointed bandmaster when the band was formed in 1885. Mr Lewins served as bandmaster for 50 years which was claimed to be an Austraian record at the time . Mr Lewins who was born in England came to Australia in 1884 and retired as bandmaster in 1938. 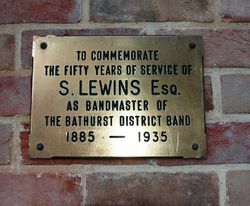 Over 300 citizens and visitors attended a dinner held at the Bathurst Hall on Saturday evening to mark the fiftieth anniversary of the foundation of the Bathurst District Band, and to celebrate the golden jubilee of the bandmaster Mr. S. Lewins who, during the last half century, has been the only leader the combination has known. During proceedings the claim was made that Mr. Lewins's unbroken association of 50 years with the band, as master, constitutes a world's record. The Mayor presented to Mr. Lewins a silver electric reading lamp, the gift of the bandsmen, as a tangible expression of their appreciation. The gift was accompanied by a fountain pen from the bandsmen, and a token from the Methodist choir, organist, choir master (Br. E. A. Cox). The presentation was followed by a surprising announcement by the Mayor. He said the citizens' committee which had been formed to organise a fund for the band, had decided to earmark a percentage of the proceeds to provide the means to display the citizens tangible appreciation of Mr. Lewins. It had been decided to erect an ornamental gate in Machattie Park. The exact site had not yet been chosen, but erection of the memorial would proceed as soon as possible. In response, Mr. Lewins said he felt unworthy of the tributes paid him by the citizens. He had always tried to do his best and, if that had pleased the people of Bathurst, he was most gratified. He said his success had been made possible by the loyalty of the bandsmen. Work has commenced on the erection of the bronze gates in Machattie Park to commemorate the services over half a century to the District Band of Mr. Samuel Lewins. The foundations of the gates are now being excavated at the corner of the park nearest the Fire Brigade station in William Street. Portions of the memorial have yet to come to hand from Sydney, but it is expected that the work will be completed in about three weeks time. National Advocate (Bathurst, NSW), 16 July 1936.